Gretchen and I are not heavy eaters. At our age, we generally do not go in for the "Farmer’s Special Breakfast" or anything like it, because we do not do enough physical work in the normal course of events to eat more than a light breakfast like Yoghurt or cereal. Since we moved to Floyd, the weather has been in the 20’s and we have been schlepping heavy boxes around in biting wind. Even short spurts of activity can leave us gasping for breath. After a long day of such activity we find that we have huge appetites and can fall asleep at the drop of a hat. Yesterday morning, we were eating breakfast in the Blue Ridge Restaurant in Floyd, VA, just north of the only stoplight in Floyd County. They serve typical American fare with a generous dose of local hospitality. This is not a Yuppie, or hippie, hangout and they do not serve lattes. Almost everyone wears a trucker hat and most of the diners wear their parkas while eating breakfast. I normally order a vegetable omelet with a side of bacon, but this particular morning, the menu had pork tenderloin strips, eggs, and home fried potatoes. I was so hungry that I wanted nothing else. It was no surprise that Gretchen opted to follow suit. The breakfast appeared in a few minutes and was too striking to pass up as a photo opportunity. It is a good thing that I took the picture quickly. The plates were clean in minutes. May you find a place like the Blue Ridge Restaurant when you need it. This entry was posted in Country Living, Food and Drink. Bookmark the permalink. David, I can’t see the picture. Thanks for the nudge. I wrote this several hours ago and set it to publish after midnight. Somehow the image did not publish. I fixed the image problem and you should see our breakfast in all of its glory. 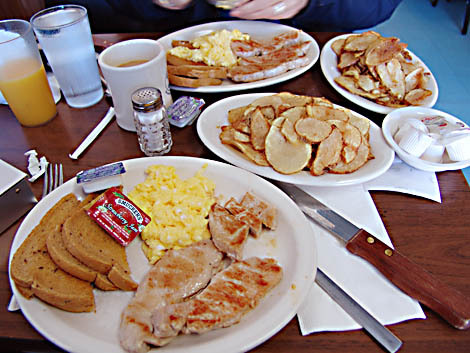 The round slices in the smaller plate in the middle are the local version of home fries. Fresh potatoes are sliced thin and deep fried until crisp on the outside and still meaty on the inside. Delicious! Dropped by the Blue Ridge yesterday; ran into wonderful old friends and enjoyed their terrific potato soup. Once I spent four hours there in discussion with three complete strangers, and a waitress, also a stranger, at another time rescued me with strong tea and sympathy during a difficult time.